Hi guys! Since Easter is only a week and a bit away, I thought that today I'd share my favorite looks for one of my favorite holidays! I tried to keep everything around $100, but there are really good gems around the $50 mark too. As much as I love pastels and seersucker, I try to go for options that can be worn tons, not just once, so these are my pics. 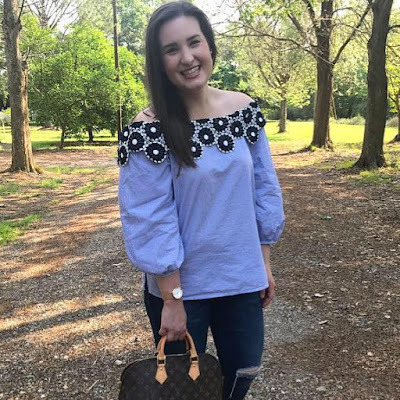 If you're going for a more casual "jeans and a cute top" look, I LOVE this off the shoulder top from Loft. It runs a bit big, so order one size down. It fits really well, is so different from other tops I've seen, and is very easy to move around in, which is rare for an OTS top. Paired with cropped white jeans and my favorite wedges, I think it'd make such a comfy, but cute outfit! Sorry for the bad iPhone quality shot, but I wanted to show off the shirt! If you are planning to dress up a little fancier, I highly recommend this blush lace dress (currently $25 off!) from Loft or this white lace bell sleeved dress from Target! I love and own both and personally can't decide which to choose! I think they're both great to have in your closet, and with the code DRESSY the white one comes in UNDER $25! Such a steal! Hope this helps if you're still looking for that perfect Easter outfit! Let me know your favorites below!